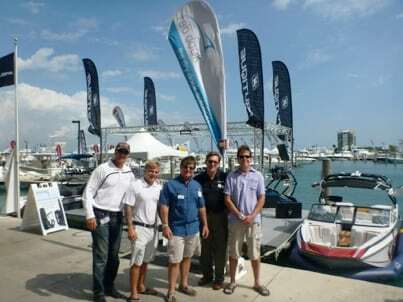 The boat show weather curse continued in Miami with the heavens opening up on the Friday and one of Miami’s coldest days on record on the Sunday. All the locals were scrambling to find any old jacket to try and keep warm and all the northerners who had come down for the warm Florida weather had thought they had got off at the wrong place. The rain had actually started Thursday night after I had decided to take the USA FAB Dock team out to dinner to thank them for all their efforts in getting the FAB Dock showcased at such a prestigious event. And so it is a testament to their dedication that it didn’t strike any of us until the end of the night as we were waiting in the rain for the valet to return our car, that everyone else around us were couples enjoying their romantic Valentine’s Day dinner surrounded by roses, balloons and chocolates. So I would sincerely like to thank all those wives and girlfriends that allowed their men to leave them on the most romantic night of the year to pursue the FAB Dock cause. Once the rain had subsided, the boat show itself was a roaring success. Once again, we received an overwhelmingly enthusiastic response from everyone that passed by. 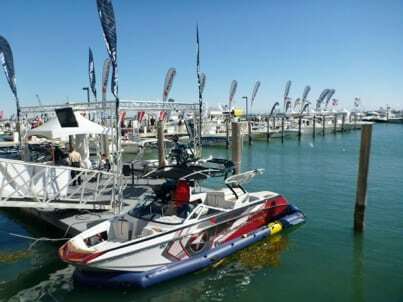 I would also like to take this opportunity to thank Miami Ski Nautique for sharing their stand with us and having two of their boats live in FAB Docks for the duration of the show. 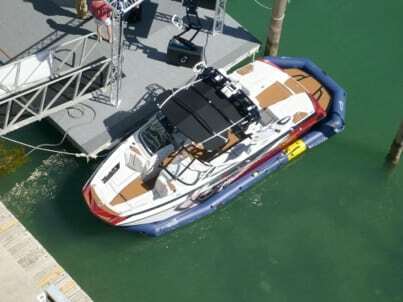 And a special thank you to Sammy for being our test driver for our new FAB Dock video and to Luke who put the berthing benefit of the FAB Dock to the test with the quickest entry I have ever seen. We didn’t have the radar gun out but I heard estimates of up to 20 mph. We look forward to seeing everyone again next year. Since 2011 FAB Dock have been helping boaties world-wide to save time, money and the environment. Our team of boating enthusiasts understand the need to make boating easy and have worked tirelessly to develop a superior and economical dry docking system that suits all vessel types and locations.